100% Authentic - New In Box. 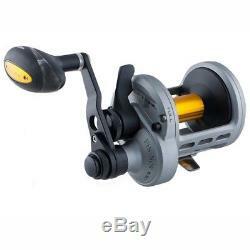 Zebco / Quantum Lethal 2-Speed LD Trolling Reel 16sz (LTL16II,, BX2). Please read item description for full details. With braided line in mind, Lethal leverdrag reels were engineered for strength and durability. If you need to down shift and winch, there are three sizes of 2-speed Lethal leverdrag reels to choose from that include all the great features of the single speed models plus an easy-to-use shift mechanism. With a simple push of a button you can drop into low speed and take control of the battle. Features: - Solid one-piece aluminum frame and side covers - Heavy-duty MegaDrag with carbon fiber washers - Super-tuned spool with durable hybrid ceramic bearings - Two-stage drag profile for versatile applications - MegaShield multi-layer corrosion protection - 6.2:1 / 3.0:1 gear ratios - 6 Double-shielded stainless steel bearings Specifications: - Mono Capacity yds. : 350/20 - Braid Capacity yds. : 450/50 - Drag Lockdown: 35 lbs. Gear Ratio: 6.2:1 / 3.0:1 - Inches Per Turn: 49" / 24" - Weight: 24.3 oz. We are adventurists sharing the outdoors with everyone. We offer a wide variety of outdoor camping and hunting gear. If you don't see what you're looking for, send us a message. We pride ourselves on honesty and work hard to get what you need at the best price possible. Please join us on Twitter, Instagram, Pinterest or Facebook to follow our adventures. See you on the trail and enjoy your hike! Images are stock photos and may not represent newer updated models. Customers are automatically enrolled to receive promotional emails. Manufacturing defects vary by individual Brands. We will give instructions as what is to be done on a case by case basis. Powered by SixBit's eCommerce Solution. The item "Zebco / Quantum Lethal 2-Speed LD Trolling Reel 16sz Gear Ratio 6.21 / 3.01" is in sale since Wednesday, October 25, 2017. This item is in the category "Sporting Goods\Fishing\Reels\Other Fishing Reels". The seller is "bubnugget" and is located in Vandalia, Missouri. This item can be shipped to United States.